Animals and plants are distinguished by many features, one of which is the cell wall. In plants, this structure acts like a skeleton, providing support and stability, and also like muscle, passing water from the ground all the way to the highest leaves and branches. The structure responsible for water transport is the secondary cell wall, which NAIST Prof. Taku Demura has been studying because it is constituted of xylem. "Xylem is an important resource for land plant biomass. Modifications of xylem cell differentiation are important for strategies to improve plant biomass resources," believes Demura. The secondary cell wall is composed of three types of polymers, cellulose, hemicellulose, and lignin. In a new study that can be read in Plant Cell, Demura's laboratory found that these three polymers in xylem cell mutants contribute to secondary cell wall formation independently of each other, challenging the contemporary model of plant growth. Interaction between cellulose and hemicellulose is critical for giving cell walls their strength and elasticity to push water upward. Interaction with lignin adds the hydrophobicity that gives an electrical charge to the push. Studies in the early 1980s had convinced scientists that the formation of the secondary cell wall occurs in consecutive events, beginning with the synthesis of cellulose at the cell surface, followed by the deposition of hemicellulose that bonds to the cellulose, and finally the migration and polymerization of lignin. These interactions result in the three polymers taking an obvious spatial pattern in xylem cells. 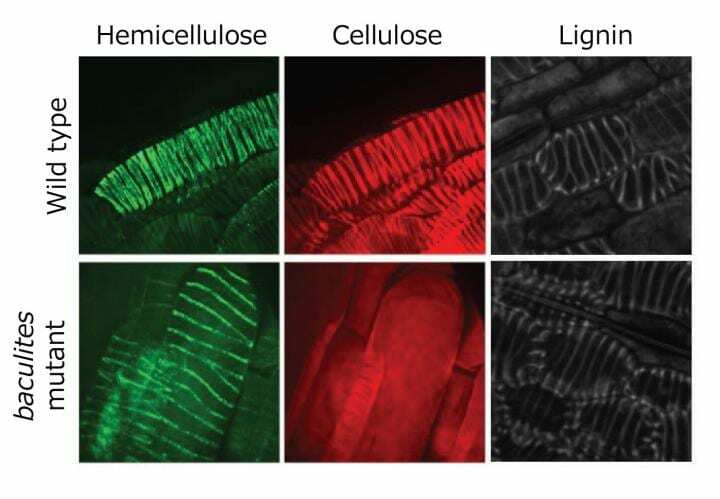 However, xylem cells in a mutation of Arabidopsis thaliana, a small plant commonly used by scientists to study plant growth, made by the Demura lab, showed disrupted cellulose synthesis without disruption of the spatial patterning of hemicellulose or lignin. "We made a mutation in the cellulose synthase gene CESA7. This mutation prevented the formation of cellulose. Despite the lack of patterned cellulose deposition, we saw patterned deposition of hemicellulose and lignin," explains Dr. Misato Ohtani, who contributed to the project. Additional study revealed that the sustained patterning could be attributed to microtubules, molecules seen in just about all life, including humans, and is responsible for transporting materials within cells. "We were able to disrupt the hemicellulose and lignin patterning when we disrupted the microtubules with a drug. This suggests that during secondary cell wall formation, the hemicellulose and lignin are regulated by microtubules and not cellulose," continued Ohtani. Considering the increasing efforts to bioengineer plants that can produce resources at higher efficiencies or withstand extreme changes in climate, Demura notes that elucidating the mechanisms of how fundamental plant structures like the secondary cell wall develop will help scientists achieve these goals. "Identifying the independence of cellulose, hemicellulose and xylan suggests we can modify one without modifying the other in plants," he says.